Spring is such a refreshing season in the Chicago area, especially right after a long winter. Chicagoland winters usually feature the typical cold and snow, and sometimes even temperature drops to mind blowing levels of cold at negative 30 to 40 degrees during the deep freeze. Now that the cold and snow are behind us, people can enjoy being outside and appreciate the new spring growth as flowers and trees will soon begin to bloom throughout the city of Chicago and its suburbs. There is a wide diversity of native trees in the Chicago area that contribute to beautiful yards and landscapes. 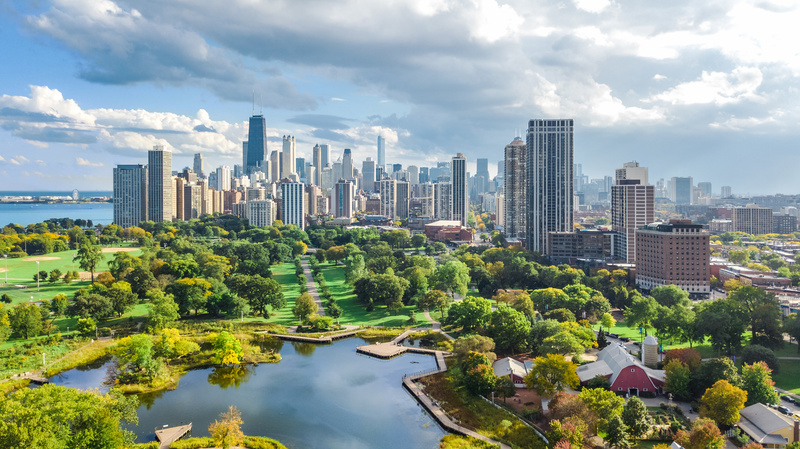 The diversity of trees throughout Chicagoland adds much natural beauty to one of the largest metropolitan areas in the U.S. There are also a number of flowering trees in the area that enhance the beauty of outdoor spaces, attract wildlife, and fill the air with fragrant smells. In the next few weeks, many of these flowering trees will bloom and add a nice spectrum of color to the natural landscape. While the new growth and blooming flowers on trees make the spring season beautiful and exciting, there are plenty of natural threats that can harm and even kill your trees. Tree diseases and pests can lead to so many issues with affected trees including leaf yellowing, defoliation, branch dieback, and even the death of the tree. 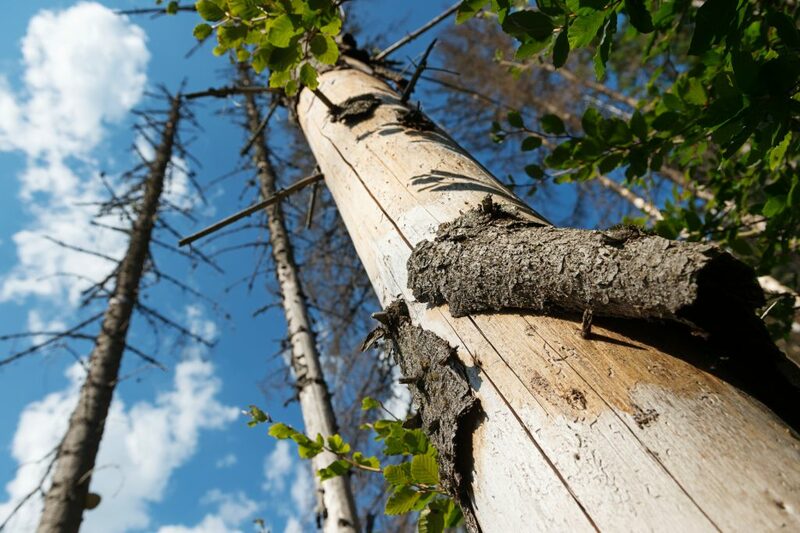 In many cases with tree diseases and insects, a lot of damage may occur before you start to see signs of the problem. It is very important to provide your trees with the proper care to help them better resist diseases and harmful insects so they can remain healthy and vibrant. If you do not recognize the signs of insect infestations and diseases and react quickly, you may be forced to remove the tree. At Hendricksen Tree Care, our arborists are committed to providing your trees with the proper tree care and maintenance to avoid insect infestations and diseases. We will ensure that your trees are properly pruned and fertilized, and we will also inspect your trees for signs of diseases or insect infestations. If your tree does become affected by pests or a disease, our arborists will do all they can to treat and save your tree. We will only resort to tree removal if there is no hope in saving the tree. If you want to give your trees the best chance of avoiding pest infestations and disease with effective tree care services, contact Hendricksen Tree Care. We provide complete tree care services for all types of trees in the north and northwest Chicago suburbs. It is important to be familiar with the following tree diseases and insects so you can recognize the signs of these issues and give your trees the best chance of being saved. Dutch elm disease is a fungal disease that attacks elm trees including the American elm. This disease is spread by the bark beetle which brings the fungus to the tree. The fungus then finds its way inside the tree and clogs the vascular tissues, disrupting the movement of water within the tree. Elm trees affected by this disease will have wilting leaves and branches that will eventually lead to branch dieback. If Dutch elm disease is not treated in time, it will lead to the death of the tree. Wilting of the leaves and branches and brown streaks in the sapwood are the main signs of Dutch elm disease. Tree blight is a general term that describes a group of diseases that cause wilting, browning of the leaves, branch and leaf dieback, and stunted growth. These diseases can be caused by either a fungus or a bacteria and they start by attacking the leaves, causing them to become wilted and discolored. If tree blight diseases are not treated quickly, the leaf and branch dieback will get worse and the tree will need to be removed. Leaf scorch is a disease caused by extreme weather conditions that can attack many different types of trees. The leaves of the affected tree will start browning around the margins and tips and the veins will become yellow. As the disease progresses, the leaves will wilt and fall off. Trees affected by leaf scorch can generally be treated with watering, effective fertilization, and light pruning to remove the affected leaves and branches. 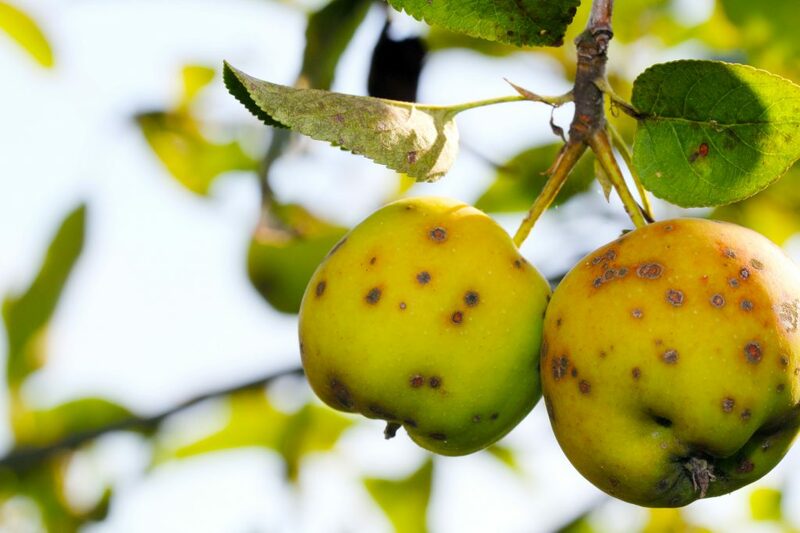 Scab is a fungal disease that attacks the fruits produced by trees and is most common among apple trees. The fungus causes brown and black lesions to appear on the surface of the fruit, leaves, and buds. Trees affected by scab are rarely killed by the disease, but they will experience leaf dieback and significantly lower fruit yields. Scab can be treated with fungicides as well as the removal of the affected areas. Oak wilt is a serious fungal disease that affects all types of oak trees. Oaks that are affected by this disease may experience leaf discoloration and defoliation, wilt, discoloration or vascular tissues, and eventually death. Oak wilt is often spread by insects or through root grafts and it attacks the tree from the top down. Certain species of oak are particularly susceptible to this disease and can die within one growing season. It is very important to take preventative action against oak wilt because this disease cannot be cured. Verticillium wilt is a fungal disease that attacks over 350 species of flowering plants. The fungi that cause this disease develop in the soil and often infect trees by either entering through wounds or directly though the tree roots. The disease affects the vascular system of the tree, leading to yellowing and wilting of the leaves and branches. If the disease is confined to a specific area of the tree, the affected leaves and branches can be removed. However, if the disease is allowed to develop over a couple of years, it can overtake and kill the tree, especially older trees. Most plants can survive and recover after being affected by Verticillium wilt. Pine wilt is a disease caused by nematodes that are spread by the sawyer beetle. The nematodes multiply within branches of pine trees and attack the needles, causing discoloration and eventual dieback. Exotic pine trees are more susceptible to this disease than native pines as native pines typically survive cases of pine wilt. However, any pine affected by pine wilt will die if the disease is not contained and treated. Anthracnose is a fungal disease that can affect different types of trees including ash trees, oak trees, sycamores, and dogwoods. 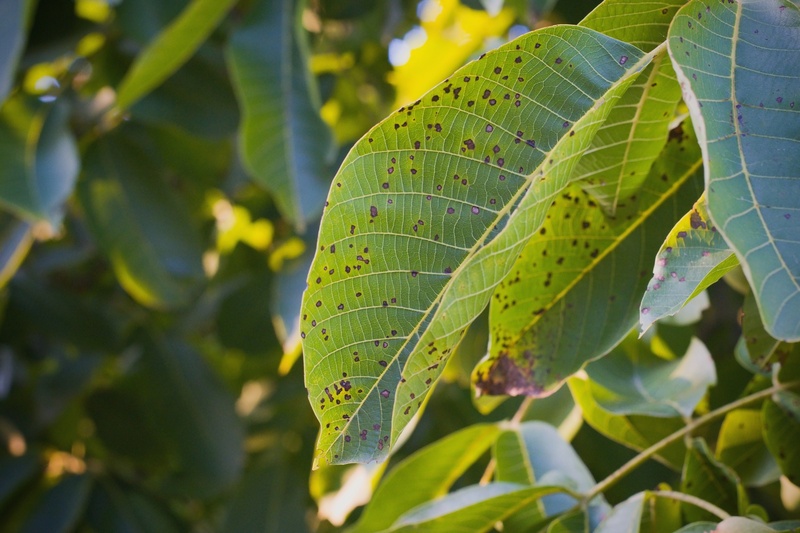 This disease can attack leaves, shoots, flowers, and fruits, causing dark lesions to form in the affected areas. Irregularly shaped brown or yellow spots will form on the leaves which can lead to defoliation. Trees affected by anthracnose can be saved by pruning the affected branches and with applications of a copper-based fungicide. Cankers are areas of dead bark on the trunk or branches that can be caused by pathogens like fungus and bacteria or mechanical injuries. Cankers can cause serious damage to a tree as they can girdle the branches and they leave the tree vulnerable to wood decay and harmful organisms. Trees affected by cankers can be treated with proper watering and pruning. 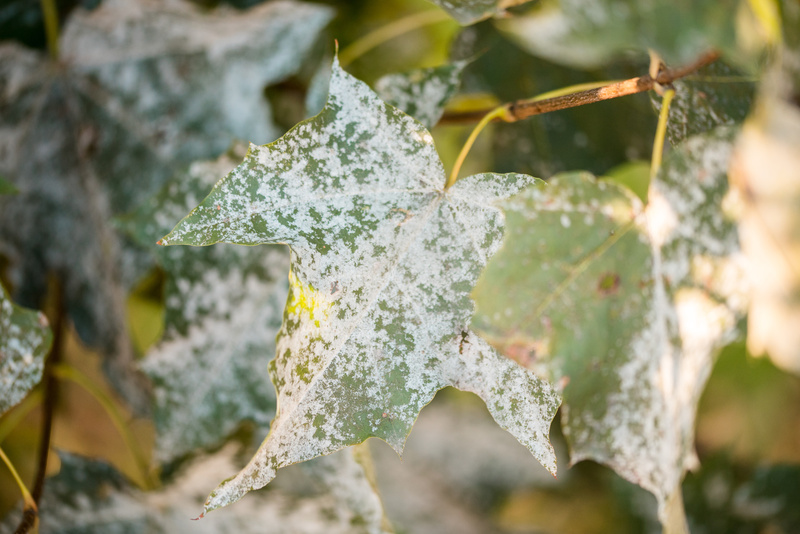 Powdery mildew is a fungal disease that can affect many different plants. The fungus causes powdery white spots to form on the leaves that will grow in size and spread throughout the tree. This disease is very easy to recognize and can be treated with fungicides. Powdery mildew will slow the growth of the affected tree and will only kill the tree if the infection becomes very severe. The emerald ash borer is one of the most destructive insects that can affect trees in the Chicago area. These green beetles are an invasive species that typically attack ash trees, resulting in very serious damage. Adult emerald ash borers feed on the leaves of ash trees early in the spring and mate. The eggs are laid in the cracks and crevices of the bark. When the eggs hatch, the larvae feed on the vascular system and inner tissues, boring tunnels into the wood of the tree. When the larvae mature, they cut D-shaped holes in the bark and exit the tree. Emerald ash borers are very destructive and must be managed quickly to prevent the death of the tree. The gypsy moth is a destructive invasive species that causes harm to many types of hardwood trees. The larvae of these moths contribute to major defoliation because it feeds on the leaves of affected trees after hatching. 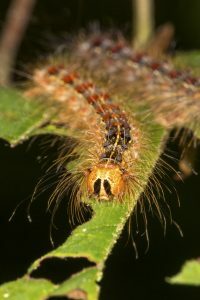 Gypsy moth caterpillars are brownish in color with long hairs that protrude from their bodies and red or blue spots along its back. They can be seen feeding on leaves during the day and they hide on the underside of the leaves when not feeding. The larvae will enter their pupal stage in mid-summer and emerge as adults that only live for a couple of weeks. Certain insecticides are effective in controlling gypsy moths. Bark beetles are small brown beetles that feed on the wood and tissues underneath the bark of a tree. While bark beetles can attack healthy trees, they mostly settle for trees that are already weakened, diseased, or dead. These beetles typically breed in one area of the tree between the bark and underlying wood. They feed on the wood underneath the bark, leaving winding tunnels etched into the wood. Healthy trees can defend themselves against bark beetles with sap and resin production but weakened or dying trees with bark beetles will need to be removed. The Japanese beetle is an invasive scarab beetle that feeds on the foliage and fruits of around 300 species of plants in the United States, including birch trees and linden trees. These beetles are easy to spot with their copper colored wings and metallic green head and thorax. 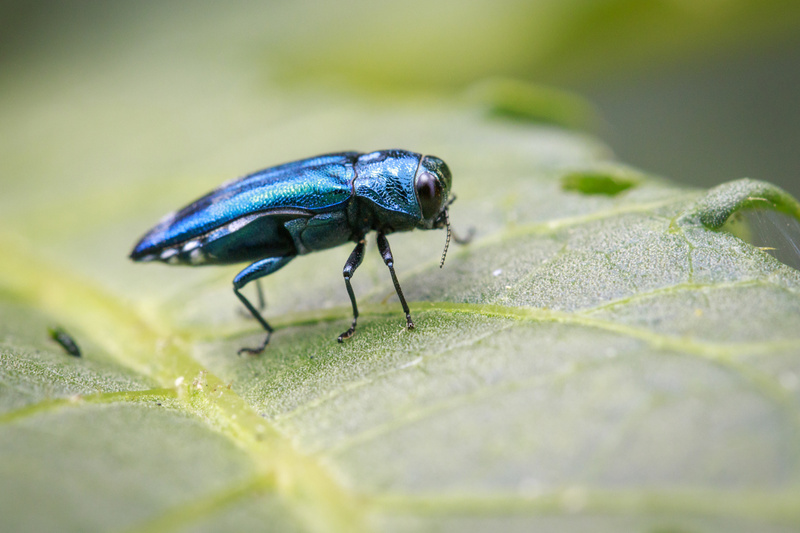 Japanese beetles were accidentally introduced to the U.S. in the early 1900s and are a major problem because they have no natural predators in North America. The adults lay their eggs underground and feed on roots in the soil when they hatch. The larvae mature into c-shaped grubs that feed on bigger roots which can cause more serious damage. After the grubs pupate, they emerge from the soil as adults on feed on leaves and fruit above ground and release a pheromone that attracts more beetles to the plant. These beetles will skeletonize the leaves of a shrub or tree from top to bottom, leading to major defoliation. Japanese beetles can be controlled with pyrethrin-based insecticides or soapy water. Cankerworms are caterpillars that feed on the leaves and buds of many different types of trees. A large outbreak of cankerworms can cause major defoliation. There are two types of cankerworms; fall cankerworms that emerge as adults in the fall and lay eggs on the tree, and spring cankerworms that emerge as adults in the early spring. The eggs of both types of cankerworms hatch in the spring and they spend the spring and summer feeding on the foliage of the tree until they fall to the ground to pupate. The defoliation that cankerworms cause can lead to branch dieback and root decline after two or more years of an infestation. Healthy trees can usually withstand one year of a cankerworm infestation. Arborists can control cankerworms with pesticides before the second week of feeding. Tent caterpillars are social, colorful caterpillars that feed on leaves of broad-leafed trees and build silk tents on the leaves and branches. These caterpillars are dark in color with brightly colored stripes and hairs and they often feed and live in groups. They will feed on young leaves and buds, contributing to defoliation of the tree. A major outbreak in a forested area can defoliate thousands of acres of trees. For the most part, trees affected by tent caterpillars can survive defoliation with no permanent damage, but it is possible for tent caterpillars to kill parts of a tree if they return to defoliate over several years. 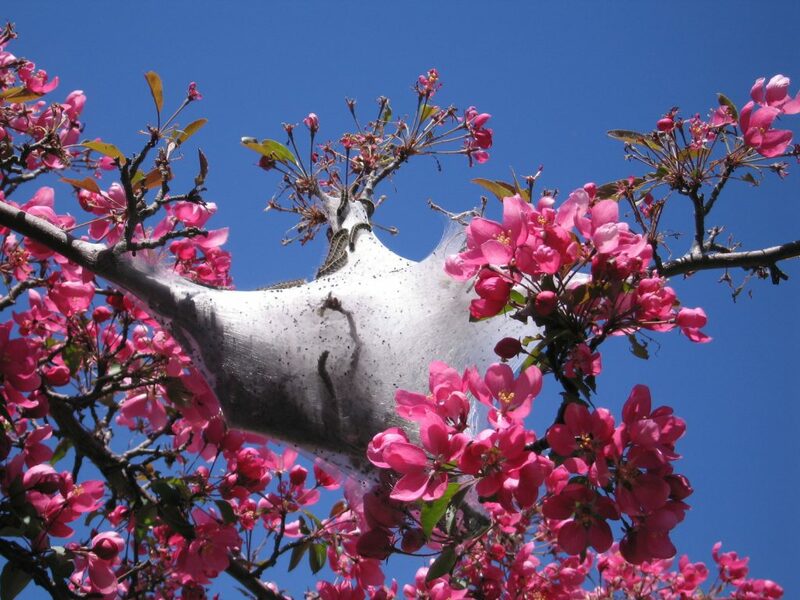 You can treat tent caterpillar infestations by removing the branches with their tents and with insecticide treatments. Flat-headed borers, including the bronze birch borer and Pacific flatheaded borer, are beetles that cause significant damage to trees. These beetles lay their eggs on the bark of trees in the spring and the larvae bore into the tree when they hatch to feed on the living tissue under the bark. Flat-headed borer larvae have cream-colored segmented bodies with a large, rounded flat head. They feed and pupate within the tree, emerging the following spring as adults. The larvae leave tunnels in the wood as they feed and cause the bark to peel off. This can result in dead branches and eventually the death of the tree. It is best to prevent an infestation from flat-headed borers because they are difficult to control once they appear. 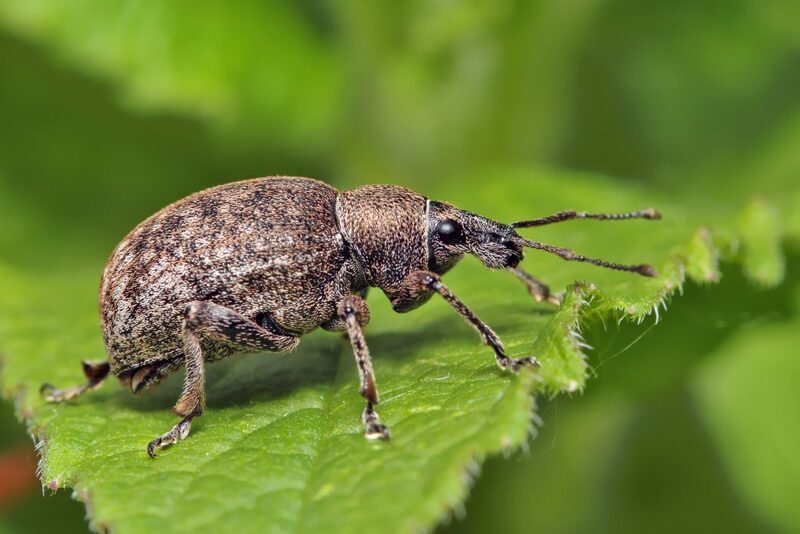 Weevils are small brown beetles with an elongated snout that attack crops and fruit trees. Adult weevils emerge in the spring and feed on the bark and foliage of fruit trees, but rarely the fruit itself. This results in defoliation, reduced fruit production, stunted growth, and twig dieback. Weevil larvae is more dangerous because it feeds on the roots of the tree which can lead to serious damage. Trees affected by weevils will generally survive and can be controlled with certain pesticides. Spider mites are very tiny arachnids that are either pale or reddish brown in color and they live in colonies. They feed on the fluids within the leaves by piercing the leaf tissue which can lead to yellowing of the leaves and defoliation. It may be difficult to spot individual spider mites because they are so small, but it is easy to find their webs on the underside of leaves where they live in colonies. 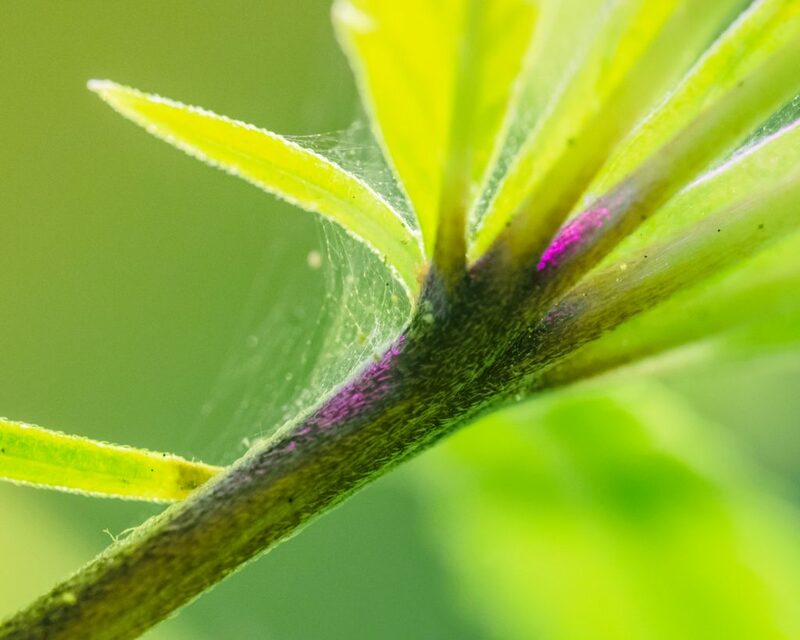 Spider mites are best controlled with organic methods because pesticides kill their natural predators. Effective pruning to remove affected branches and leaves can help control spider mites. Aphids are small, sap sucking insects that attack many different types of plants and trees. These small insects are usually bright green or orange in color, and they pierce the surface of leaves and twigs to feed on the sap. The feeding itself is not what causes the most damage, these insects can transmit viruses that are damaging to the tree and their honeydew secretions can cause additional problems such as sooty mold. 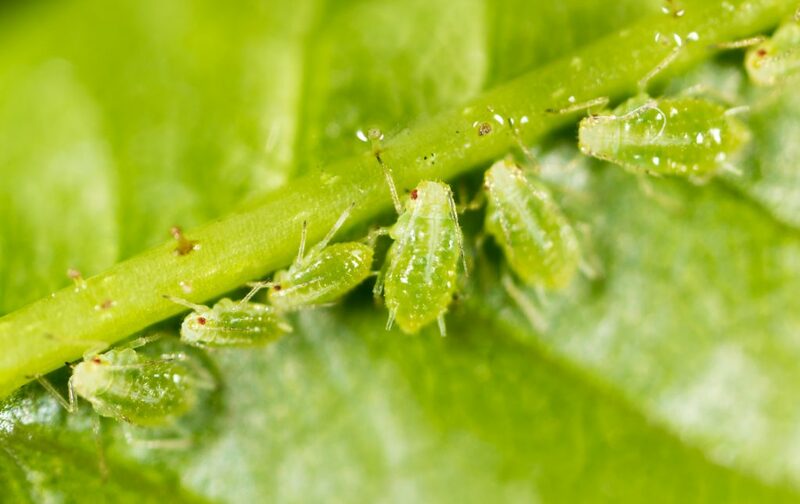 The best way to control aphids is to spray affected plants with a strong water jet or use an insecticidal soap solution. Coming soon we plan to have a detailed explanation of each tree insect and disease to give a more detailed overview. As always, it is generally best to contact an experienced tree insect and disease arborist to keep your trees healthy all year round.